Prepare early -- one year at the least; two years and you depart with most of your sanity. Test your systems while you are still within reach of the vendors. Many have short memories. Establish a good relationship with a chandlery and keep your checkbook handy. Remember what it is all about! Are we having fun yet? Now that we are into our 4th years...here are some thoughts. Third and Fourth year thoughts are in RED. At the time of rebuilding the engine we did so many things that are too numerous and tedious to mention here, so only the highlights of the story shall be told. While the engine was out we took the time to replace all the plumbing for the engine including the raw water delivery system, the exhaust system, and upon completion I noticed that there was only one hose that we had not replaced, but it looked serviceable and I decided that it would be too much work (15 minutes and a trip to West Marine) to do it right. Plus the engine was ready to be put back into the boat. (I will get back to this problem later.) Now the engine is in and we are going out for a test of the engine and to anchor out in Richardson's Bay in Sausalito. Just when we got outside the entrance to our marina an engine alarm went on and it appeared that the starter alternator had slipped it's belt. No worries, we are a sailboat and there was plenty of wind so off we go and we will fix it when we get at anchor. Now we are at anchor and I get to the task of fixing the alternator. Lo and behold, not as simple as I had assumed; the bolt holding the alternator on decided to break. The engine was talking to me, I just didn't know it at the time. I figured that some dummy like me had tightened the bolt too tight and it just broke. Nothing just breaks, the boat was talking to me and I would not find out what she was telling me until the day we left SF Bay for southern California, The First Time. The First Time. It is June and there is a south wind in the air and we are leaving the bay area, our friends give us a good send-off in the morning and off we go…. not! That little hose, the only one we had not replaced started leaking while going out the marina entrance. We turn back and take an end tie at our marina, much to our friends' surprise, and I take that ride to West Marine that I put off a couple of months ago, and after I return, 15 minutes later the problem is fixed and away we go, again. Too late for the tide out the Golden Gate and so we decide that the St. Francis Yacht Club would be a good first stop. After a good night sleep we head out the Gate and everything, wind, waves and weather is against us. We go head long into this and we notice that the engine is vibrating heavily. Enough so that maybe... this is what caused the bolt to the alternator to break a couple of months ago? We decided that this problem should be addressed and headed to Alameda to consult with the prop experts at Alameda Prop at Grand Marina. Chuck, the owner, is a thorough professional and with his help, despite the books that carried the wrong specifications, we got to the bottom of the problem. The coupling from the V-drive to the shaft was out of round, the shaft was .008 of a inch out of round, and the prop was the wrong size for the engine configuration that we have. This process took almost a month of our cruising time to sort out, but now we were really ready to head south. The Second Time. No vibration and the engine performing to specifications and now we are heading out the Gate, with everything hitting on all cylinders. The boat had been talking to us and had we the ability to listen to her, these problem would have been no problem as they would have been fixed before we left. Listen to the boat, consult with experts, and remember: there are no little sounds that the boat makes without a very good reason. While cruising around the SF Bay we experienced some condensation around the icebox, but the bay area is a cold and damp place; the problem should go away when we get to warmer water...another bad assumption on our part. As we went south the condensation got worse and the refrigerator was on must of the time. We had a new problem, actually an old problem that we could not ignore any more. While at the San DiegoYacht Club we explored several options to fix the problem, there is always a solution if you throw enough money at it, it just isn't always the right solution. We looked at adding more insulation to the outside of the box and more to the inside of the box, but to my way of thinking having ignored the problem for all too long, we may have to get to the root of the problem (we're learning). 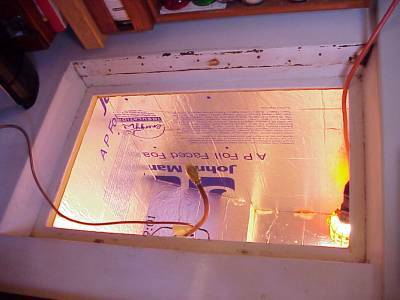 After some test holes, which confirmed that the insulation was soaking wet, Diane and I determined that the best course of action was that we must tear out the whole ice box and begin anew. We got ten garbage bags of wet insulation and icebox liner out and off the boat. Fortunately the SDYC was remodeling their dining room and had a large construction dumpster for us to use. Now we needed to collect the materials necessary to reconstruct our new icebox. Fortunately, Home Depot was a bus ride away and the marine stores, West Marine, San Diego Marine Exchange, Downwind Marine, were just a couple of blocks away. After a day of assembling the material: 1 4'x8' sheet of plywood, 2 4'x8' sheets of R-14 closed-cell foam, glue, epoxy, fiberglass cloth and cans of injectable closed cell foam. We are now ready to begin.....8 days later we have an icebox again! Since we rebuilt the icebox our battery consumption from the refrigeration has decreased by at least 50% and it is even warmer here in Mexico. Also noted, in San Diego there was no condensation on the sides of the icebox and here in Mexico there is very little to speak of even when the humidity is at 100%. This is another example of the boat talking to us and us not taking the time to listen. The box was poorly built at the shipyard and coring the inside confirmed this. It would have been much easier in the comfort of our home marina to accomplish this task with cars at our disposal. Boat work does go on after you leave the dock on your dream cruise. Year 3: Alas! 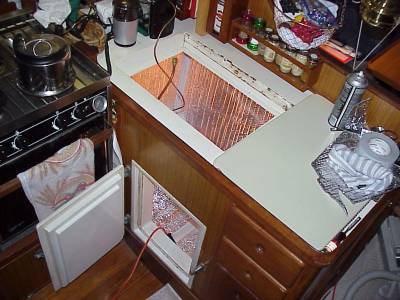 Our Ice Plus II system gave up the ghost in July 2001. We struggled with the expansion valve, the compressor, the refrigerant, the filter-dryer and every other component in the system before discovering we indeed had a leak. Suspecting the system may have been contaminated with salt water, I took a bus from Loreto to San Diego, bought an Adler-Barbour Super Cold Machine, carried it back and replaced the entire system in two days. So far, we're happy with it: plenty of ice, adequate refrigeration, reasonable energy consumption and a good reputation for trouble-free long-life performance. Anchoring a boat should be a piece of cake with a few caveats. First, the SF Bay is a challenging place to sail, but a lousy teacher for anchoring. I mean, you can throw out anything almost anywhere and have a sound night's sleep. It is a little different out here--you can set the anchor 2 or 3 times before you are happy. With that in mind we haven't dragged anchor yet, but there is always a first time. When we started, we were pretty cavalier about it--we thought we were good, but we hadn't anchored at the Farallons or Ano Nuevo. At the Channel Islands, we learned so much from the Santa Barbara sailors and are grateful to them for their friendliness and willingness to share their knowledge. We learned about setting bow and stern anchors, using Flopper Stoppers and having neighbors closer than we were used to. Later in the trip, we learned that our anchoring equipment was not up to the task. Our bow roller and windlass failed at the first roadstead anchorage (Cabo Colnett). We limped along until we arrived at La Paz and upgraded to our new system, all carried down from the States after our Christmas visit home. The new equipment that I installed (bow roller and the Maxwell windlass) are doing great and I don't know how we ever lived without them. Like I said, in the SF Bay you can anchor with anything, but out in a roadstead you always wish you had a bigger, stronger, heavier anything connected with the anchoring system. New bow roller and windlass have been holding up to the task. The Bruce anchor, we have the 20 kilogram model has performed exceptionally. Our backup anchor is a 46 lbs Delta and in order to learn more about it, we decided to give it a try for awhile. We used it all summer and it has performed as well as the Bruce did and frankly we were a little surprised, pleasantly that is. We now have 2 anchor that when we deploy either one, we should get a good nights sleep. And that is what a good anchor is all about, a good nights sleep! What can I say about HF interference except that there is quite a bit of it bouncing around the boat, especially when we are transmitting e-mail on the SSB radio. There seems to be no one authority on the subject matter of interference and much of what progress we have made in reducing it has come from talking to anyone who has a great signal on the radio, taking in the ideas, and much trial and error. The SSB on the high power setting interferes with most circuits on the boat. Our autopilot had a very hard time steering a straight course has almost completed a circle before we could turn it off, while sending or receiving e-mail. We learned that when transmitting e-mail, it had the greatest effect on the autopilot, and that most voice transmissions had no effect on the pilot at all. For email we turn off the pilot and with voice, we keep a tight watch to make sure the pilot is steering correctly. We have found that anything with a rheostat (Cabin light and fans) can and will cause a high pitch hum in the stereo and the SSB on most frequencies. Some of the following has been found to interfere with our SSB, on Gemini, and mostly with one band of frequency being the most effected. As you can see most everything interferes with something and it seems that trial and error is the most effective method in dealing with the issue. Out here we have a lot of time to work out a system of setting up the boat in a manner that the boat’s equipment doesn’t interfere SSB and visa versa. We have found that ferrite chocks aid in solving or alleviating most problems. There are many radio experts cruising and they are more that willing to share their knowledge with you as they have with us, with this and a little trial and error, we have been making progress in understanding how HF interference works on Gemini, and so can you. Year 3: We changed our ground plane, tying it to the aluminum toe rails and improved our signal significantly! Don Melcher warned us the books said it shouldn't work but encouraged us to try. Thanks, Don! We also purchased a Clear Speech digital signal speaker from Am-com, eliminating a lot of background noise--even some of the racket from the Dan Foss controller on our Adler Barbour refrigerator, which is notorious. Year 3: We have not experienced serious problems with fuel contamination, but do use anti-growth additives and a "Baja Filter" when we take on fuel. Surprisingly, the filters appear to be fairly clean after use, and the only problem we've experienced has been from metal and some suspicious gel-like globules originating in our own tank! We did have a problem with our Parker-Racor dual fuel filter system when the plastic stem disintegrated, eliminating the ability to choose either housing. However, it turned out to be a manufacturing defect and Parker replaced the unit promptly--great customer support! 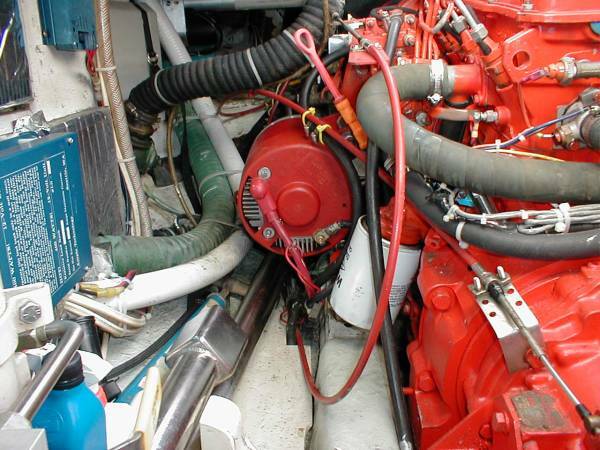 Regarding alternators consider an Electrodyne, you seem to get more amps and quality for your money without paying the marine store penalty for owning a boat. Our installation is just completed-- we have the GE-145 and get 100 amps at engine idle 900 rpms. They are very efficient high output units. They have a website ( I use Yahoo search engine) that has all the specs and phone numbers, and the owners are a father and son team who know their stuff and can point you in the right direction. I came across them in Dashew's book The Circumnavigator's Handbook. The alternator is so efficient, that I now need to increase the size of the cables between the alternator and the batteries. Oh well. Year 3: An issue we've been dealing with is the weight of the alternator, which is a little more than the standard arm can bear. We've broken two alternator bracket arms, so have to watch the situation closely--especially excessive vibration--to ensure we don't repeat this problem. In Mexico we had a heavier-spec arm made for $20 and it seems to be holding! Year 4: The arm is now almost bullet-proof, but the bracket joining the arm to the engine broke. Thankfully, a welder in Panama was able to repair it and reinforce it on the sides but we'll be carrying a spare--you betcha! 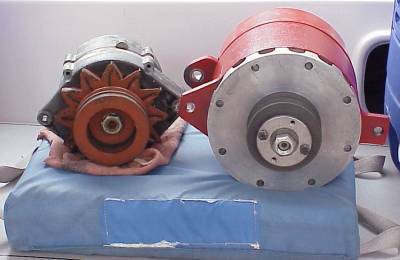 Old & New Alternators Side by Side - - Can you tell the difference? Solar panels have been the most use at the moment. We started with four Siemens 55's that do the job nicely and added two Siemens 100's the second year. We do not angle them into the sun, but people report even greater efficiency if you are ambitious enough to do so. With no moving parts, this kind of equipment offers almost trouble-free energy. The only problem we had was trying to use a single connector when we upgraded to six panels. The Marinco connector was better than the Newmark, but due to overheating, we had to split the feed in half and use two separate connectors to avoid the problem. On the subject of wind generators we chose the Red Wing that Downwind Marine in San Diego builds. It is simple, we can hang it in the fore triangle when needed at anchor and if sailing we can tow it with a prop attached to the generator. Haven't needed it yet but there is still hope on my part 'cuz if I find no use for it Diane will never let me live it down. SouthWest Windpower wind generators seem to have many problems down here, it is the one in the West Marine catalogue. They honor their guarantee really well but...everyone seems to need new parts. I would be wary..
YEAR 2: Our Red Wing wind generator works wonderfully! We were anchored in Bahia de Los Angeles for a month and used it frequently. It supplemented our our power needs and there was no reason to start the engine, great new, less wear on a very expensive generator (the engine) and a lot less noise. Since there is such an abundance of sun in Mexico, however, our solar panels remain our primary source of amps. With two 75-watt and two 150's, our simple Adler-Barbour refrigeration is amply supplied by solar with some wind when it's available. Year 1 we have had our AGM (absorbed glass mat) batteries for 1 year now and they have been great. Still too new to give it our wholehearted recommendation, but in our opinion a great choice. Year 2 We are currently in year two and have nothing but good to report on the Concorde Lifeline AGM batteries. They charged well from the engine as well as recovered quite well from some of the long periods of use where we ran them down to a little less that 50% of their capacity. The heat of the Sea of Cortez last summer (2000) did not seem to affect the performance of the batteries that we have on board (it got up to 106F where we were). We are quite please and look forward to more years of good performance, stay tuned for updates. Year 3 We started experiencing loss of power and did some remedial actions suggested by Concorde but after checking our serial numbers, Concorde suspected they were faulty and replace the entire bank AT NO COST. They shipped them to Downwind Marine where some very generous cruising friends picked them up in their van and delivered them to us in Bahia de Los Angeles in 2001. Year 4 In spite of the total replacement of all 6 batteries, we were unable to keep the voltage up on our AGM's and did some research. The best information was provided by Casa de Batterias in Panama City, where we were given brochures and a detailed technical manual by East Penn Manufacturing. The decisive issue for us was the difference between AGM and gel battery life cycles. If discharged to 25% of its capacity, an AGM has 925 life cycles but the gel has 1500. If discharged to 50%, AGM has only 370 while a gel would have 650. In a sailboat environment where full charging is rarely feasible, we decided the life cycles of a gel were the critical issue for us, and are converting to 6 East Penn Deka Group 31's. Our Spectra 180 has produced about 8 gallons an hour, using about 8 amps per hour. We shared some initial growing pains with other Spectra users after the old "biocide" proved incompatible with the new high-tech plastic components. But Spectra stood by their product and provided replacement parts along with free labor from Elegante's Jerry, impressing everyone with their responsiveness and great customer support. Year 3: In spite of these initial setbacks, we have not heard a single Spectra user wish they had anything else, and would strongly recommend them to anyone installing a system today. Year 4 We are so impressed with the Spectra watermakers that Les completed the full course in Sausalito and is now a fully-authorized Spectra representative and repair person. Detailed information will be added to this web site, but please feel free to contact us by email or radio if you would like to discuss any products or "care & feeding" issues. There are sooooo many systems on most cruising boats--and ours is no exception--that it's difficult to cover everything. If there's something specific you're curious about, please feel free to send us an email with your question or suggestion of what we might add to this section.